"It must be so great for the audience to think, 'Oh! The director doesn't think I'm the dumbest person in the world!'" - Sir Ben Kinglsey. That's a quote from Sir Ben in the 'making of' featurette on the Lucky Number Slevin disc. It's a good quote, and more or less applies to an excellent movie that is Slevin. At the beginning of the movie, we get a twenty year old story before jumping to now. Josh Hartnett plays Slevin who winds up with a string of bad luck and mistaken identity. The movie carries on from there with twists and turns all along the way. Morgan Freeman and Sir Ben Kingsley play the opposing mob bosses that both want a piece of Slevin and they play their roles with relish. Bruce Willis is a hit man who takes the jobs nobody wants. Lucy Liu plays the offbeat girl next door who basically just stumbles into the whole situation. She provides a lot of the lighter moments in the movie, and her and Hartnett play off each other well. This is what they would call a modern noir film, I'd suppose, and I really enjoyed it. I had wanted to see this in theatres back in March, but missed it as I do so many theatrical releases. I purposefully avoided any reviews or clips of it until I got to see it - especially after I heard they gave away one of the main plot twists in one of the secondary trailers. I'm glad I avoided any talk of it, as that's usually the best way to see a movie. However, I did figure out most of the plot twists early on (just have to pay attention), but it was still a pretty fun ride as you wait to see how it all sorts out. Hartnett certainly impressed in this role - he has an ability to go from cocky to dark and pull it off. Lucy Liu was a lot of fun to watch, and Bruce willis continues to show his acting ability in this and Sin City and 16 Blocks as more than just the Die Hard action hero we thought we knew. If you're a fan of noir, definately check it out. Or even if you're looking for something just a little different with murder and mayhem, a good story, and solid performances. 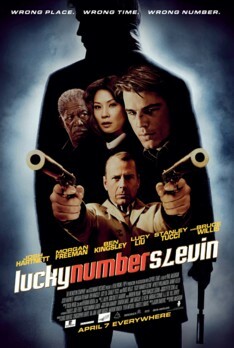 Comments on "Me Mini Movie Reviews - Lucky Number Slevin"
I was going to pick this up at the video store over the weekend but they didn't have any copies in so I ended up with "Nightwatch" instead. I'll have to put this back on the list. Maybe this week!